In this troubled time of brutality, inequality, political corruption and injustice, I’ve been swallowing the bitter pill of disillusionment as GMO labelling was undone today in the US Congress. Another blow to democracy where over 90 percent of Americans want to know what’s in their food. The silver lining is that my spirits were bolstered by being in the presence of the great Vandana Shiva: eco-prophetess, woman warrior, seed saviour. I could go on and on but I think lists are boring. Better for someone to take these one-liners and make convenient facebook memes….? Afterwards, powerhouse Elizabeth May joined Dr Shiva in conversation and my fave line from her was “Foodie is a radical concept that people want to eat food that actually tastes good.” May also urges us to stand up for the Peace River, against Site C Dam (which is primarily to enable fracking) and support the last-stand family farmers who refuse to leave their homes in the best farmland in BC. The Peace River protests are all about food security. Let’s join them. Although we have so much fighting against nature and the sustainable food movement – the huge lobby dollars, the subsidies, the bought scientists, the paid-for trolls and smear-ers… despite everything they throw at us to convince of their flawed paradigm… we aren’t buying it. Organics is growing. Yugely. Smile. Go ahead. Yes, you see through the elaborate deceptions. And your eyes are open and the future is pregnant with possibilty. Now, since it’s getting late, I’ll end with a positive quote by Dr Shiva. This entry was posted in Dr Vandana Shiva, Farmland Conservation, Food heros, GMOs, Great Events, Mobilize and March, Organic, The Environment and tagged Dr Shiva, elizabeth may, Indian summer festival 2016, site C on July 15, 2016 by Gurdeep Stephens. Yogic Farming – Say What? Ella’s singing in my head as I write. And I *get* this song; it popped into my head when I talked with Piero. It made sense, like when I fell in love for the first time and finally “got” every lyric about love ever written. In fact, love is the operative word when I spoke with the yogic farming creator of Kebio’s Santa Pasta. I asked him, “if you had one word to describe what you’re doing?” Love is the answer. I’ve heard a lot about different types of agriculture. Monoculture, industrial, organic, biodynamic. I’ve read about farmers in India dramatically increasing their yields reverting to traditional methods. When I asked Vandana Shiva about that in 2013, she said some folks believed it had much to do with uncompressing the soil. Basically, the opposite of using heavy machines. There are myriad, wonderful ways to nourish and replenish the soil through ancient and organic methods. Keep in mind, most industrial modern agricultural methods (from the 1950s on) have succeeded mostly in depleting the soil and introducing biocides into the soil, air, food and water from glyphosate and now agent orange’s 2,4 D. There are so many viable alternatives. Travels to the East have inspired pioneers in the West, as I have discovered in many early movers and shakers in the food movement. Piero had been to India and learned about Brahma Kumaris studies in Yogic Farming. So when Piero took over the management of his family farm in Italy in 2008, he promptly converted it to organic and has since implemented yogic farming. Piero’s a tall, soft-spoken, calm and twinkly-eyed Italian who lives near one of Italy’s most beautiful medieval towns (Gubbio) near Assisi. Piero’s cara mamma set up an agricultural teaching center on the farm after being horrified when a local child informed her that milk was made at the store. When I was growing up, my dad always stressed how food was better, tastier, imbued with good vibrations when one meditated on the food while preparing it. It’s about intention. I grew up with the idea of parshad, or blessed food. In Hindu and Sikh temples, after prayers, hot sweet parshad is handed out. For me, as a kid, that was always the best part! (I grew up in a sugar-restricted home). So I couldn’t get enough of the delicious sweets after invocations when I studied Bharat Natyum classical Indian dance as a child. (I was a terrible dancer, sad to admit.) In the Indian tradition of saints and sadhus, food that has been prayed upon or blessed by holy men and women is special. How? Why? This is something I’ve only just started to understand. It hit me about a year ago. I went to a Hindu temple with friends who wanted to pray with me after I had passed close to the veil. We went into this small but colorful temple. Conches were blown and bells were ringing. It was a mesmerizing atavistic cacophony. The chanting was vibrating through the speakers viscerally calling one to the higher, the divine. I slowly walked around the perimeter of the room where Gods were lovingly dressed in jewels and rich silks. Praying in the Hindu temple, focusing kind and loving thoughts for people I love, using the gods as a focal point was a new experience. After I circled the room, a bare-chested priest wearing a dhoti with marks on his forehead put into my hands a mango. This luscious fruit had been sitting on the tip of Lord Ganesh’s trunk. When I ate it later, I was continually reminded how many prayers were sent its way, passing between and amongst fibres with love and hope. A South Indian friend from Kerala explained how mothers take wedding jewelry to the temple and transmit the positive energy of prayers while wearing the jewelry. Then when it is passed onto the bride, the prayers also go with the gold. But back to the fields! There have been studies on yogic farming. To read more, look up the article in Asian Agri-History, (Volume 19, Number 2 May-June 2015 pp 105-122). They have found that meditating on the seeds and in the fields has helped the yield and the general well-being of the farmers and their families. The Indian Agriculture Minister Radha Mohan Singh in September 2015 (Article in Indian Express 15 Sept 2015), that the government supports organic and yogic farming. Piero designed the logo above and puts it on his Santa Pasta grown from ancient grains (from Spelt and older wheats like Senatore Cappelli to Millet). I made some Santa Pasta spelt linguine with broccoli for dinner 2 nights ago. (Eternal grazie to Maria de la Purification Saez in Marti for the recipe). It was delicious. We thought of the Kebio farm in Umbria and felt the love on our plates from the whole-grain pasta and the green brocoli with olio nuovo, new olive oil my typing hands helped pick from trees on his farm. For Piero, organic cultivation was just a starting point. His goal is to enhance biodiversity, the soil, and nutrition through the cultivation of ancient grains. In his practise of yogic farming, Piero said he goes into a state of mindful consciousness. He tries to reach a deep part of the self that is love, happiness purity joy, the essence of the soul. Swimming in that energy, he has loving feelings for nature. He feels like an instrument, a lens, focusing down into the fields, into the seeds, into the plants and what will nourish and sustain us and the ecosystem. The idea of praying on food or objects wasn’t a first for me. But I really lit up when I heard of yogic farming. The idea of prayer in the fields, upon the seeds strikes me as simply… bello! This entry was posted in Dr Vandana Shiva, Food heros, Organic, Sustainable Business, The Environment, Trail-Blazers and tagged Kebio, love, meditating in fields, Piero Musini, prayer, Santa Pasta, Senatore Capelli, Yogic Farming on November 24, 2015 by Gurdeep Stephens. We *will* join the other ~5 billion people in the world who know if their food contains GMOs. This includes nations that outright ban GMOs to those who require Labelling. Here is the full list by nation below. Canada and the USA are the only developed nations in the world that don’t require labelling. Powerful lobby groups are preventing us from knowing what’s in our food. This explains why despite 90% N. Americans (across all political stripes) wanting to know if it’s GMO, it has yet to happen. But it’s going to – We are going to make enough noise and demand out of this mass experiment! 70% of the world lives in countries that have protected themselves with some kind of legislation either restricting GMOs or labelling them. Given the hype, I assumed it was just Europe, Russia, China and a few others. When I examined the issue, closely for first time, I was pleased to discover not only European Countries (4 dozen) are protecting themselves, but EURASIAN Countries (18), Latin American Countries (7), African Countries (11) and Australia and New Zealand. Here are the results below. Total world population who legislate GMOs : about 5 billion. I was pleased to discover upon closer inspection that the list has grown recently from Mexico (who has banned GMO corn), to Bhutan (first nation to go organic) to Hawaii’s Big Island as of this last week. Aloha to Hawaii’s Big Island! May your population of 185,000 inspire 317 million Americans to do away with this failing and dangerous technology all together! This entry was posted in Food heros, Mobilize and March, Right to Know, The Environment and tagged Genetically modified organism, GMO on December 9, 2013 by Gurdeep Stephens. 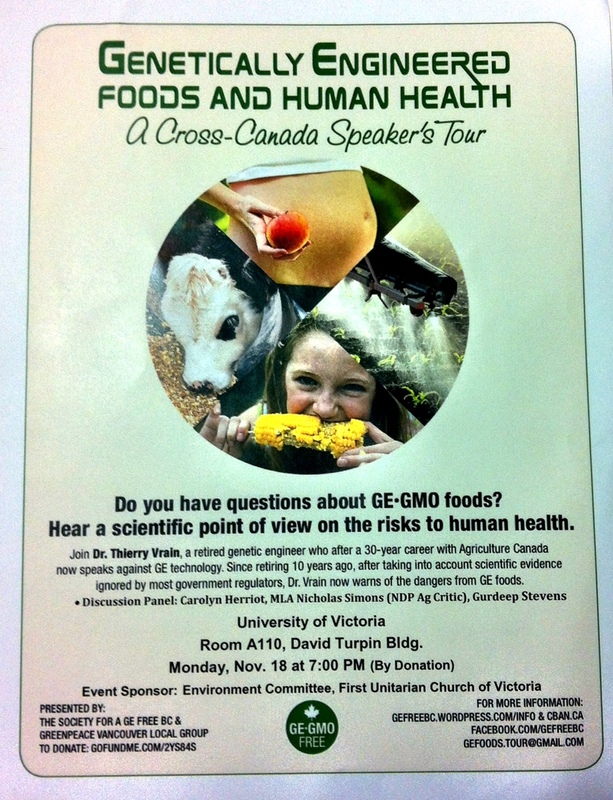 Concerned Canadians – eager for accurate information about Genetically Engineered (GE) foods – are rallying in large numbers behind two distinguished scientists who have undertaken an urgent, whirlwind national tour to share their knowledge about grave threats to human health and food security. Dr. Thierry Vrain, a retired soil biologist and genetic engineer, former head of research and designated spokesperson to assure the public of the safety of genetically modified food, is now speaking out against GE technology after a 30-year career with Agriculture Canada. Dr. Shiv Chopra, a former Health Canada scientist for 35 years was fired after going public with concerns about potential human health risks associated with bovine growth hormone. His book, Corrupt to the Core: Memoirs of a Health Canada Whistleblower, is an international best seller. They will be speaking this evening 7:00 PM (November 19) in Vancouver as momentum rapidly builds into an unstoppable grassroots movement demanding the immediate attention of elected officials, corporate executives and federal agencies. “Meetings have been packed with a cross-section of the Canadian public who are justified in having very serious questions and not trusting or believing what they are being told,” says Vrain, who has spoken five times on Vancouver Island since November 14, utilizing an avalanche of recent independent scientific studies from Europe, where genetically modified foods have been banned. “I am informing them that 80% of the food we now eat contains herbicides – including Monsanto’s Roundup – which are also antibiotics. There are traces of these toxins in all our bodies, doing damage to our gut, a slow, insidious process. “It is highly probable that genetically engineered food contains toxic proteins and we simply do not understand how these fundamental units of life work, not even after the Genome Project, and most certainly in North America, where research is compromised by corporate funding” he reports. “We must stop GE foods immediately and check this out thoroughly. To do anything else is absolute madness,” Vrain adds. He and Chopra are motivated solely by their growing mutual concern. Twenty-eight events are scheduled for the western tour, and more being confirmed for the eastern tour (scheduled for January-February 2014).This is rapidly becoming a major issue and news story. Genetically Engineered (GE) Foods and Human Health, takes place in Vancouver, at the Canadian Memorial United Church at 15th and Burrard. Ample time is allotted for questions; donations accepted. Doors open 6:30, event starts 7:00 PM. Next local stops on cross Canada tour: The speakers will be in Squamish, Nov. 20, at UBC the following afternoon (2 to 4PM,) in Coquitlam (Douglas College) Nov. 21, in Langley following evening Nov 22, returning to Vancouver, Saturday for workshop Nov. 23 at the Unitarian Church of Vancouver (949 West 49th Ave) 2:30 pm. See event map for rest of BC and Alberta. This entry was posted in Food heros, Great Events, Mobilize and March, Right to Know, The Environment and tagged Dr Shiv Chopra, Dr. Thierry Vrain, Genetic engineering, Genetically modified food, Genetically modified organism, GMOs, Monsanto, Shiv Chopra on November 19, 2013 by Gurdeep Stephens. A vocal spokesman for GMOs during his career at Agriculture Canada, Scientist Dr Thierry Vrain is now speaking out against GMOs. He farms organically now. Unlike people like me who have read the science and come to the conclusions that GMOs are not necessary to feed the world, he actually has done the science. In his TED talk http://tedxtalks.ted.com/video/The-Gene-Revolution-The-Future, Dr Vrain demonstrates that GMOs don’t increase yields, do increase pesticide use. 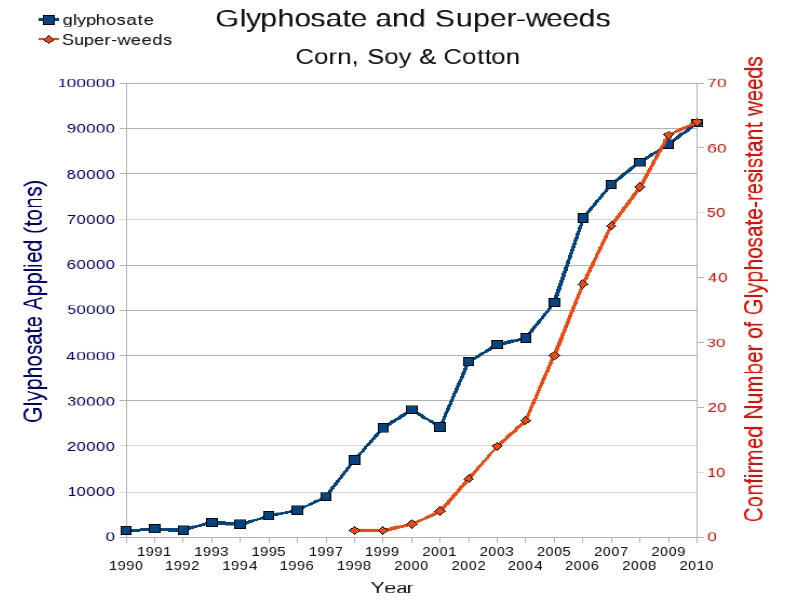 Biotech says that the crops use fewer pesticides but that was before superweeds and superpests. Pesticide use has gone up exponentially since GMOs were introduced. Hear it from the expert himself Monday November the 18th at the University Of Victoria. Come with questions and bring sceptics! This entry was posted in Food heros, Great Events, Mobilize and March, The Environment, Trail-Blazers and tagged Agriculture and Agri-Food Canada, Genetically modified organism, Pesticide, Thierry Vrain on November 12, 2013 by Gurdeep Stephens. 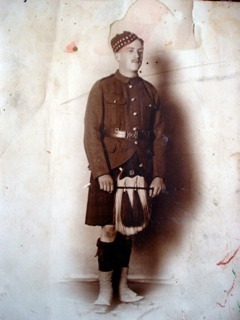 Here is a photo of Grandpa Rupert, just a teen, who enlisted to fight in WWI. (Check out the KILT! ) I was told that he exaggerated his age to join up to fight for King and Country, eager lad that he was. He came back from Europe a broken man. He barely survived the trenches of WWI, along with only a handful of soldiers from his regiment. He never spoke about the war, except to say that “war is a terrible thing”. Returning to Vancouver Island, Grandpa Rupert healed his wounds tilling the soil, growing berries. I’ve discovered that more and more war veterans are turning to farming every day. You may recall the post I did on the OTA awards and the young Iraq Vet turned organic farmer who led us in the marine oath to be Semper Fidelis. With staggeringly high suicide rates and suffering from Post-Traumatic Stress Disorder Syndrome, war veterans kill themselves at a rate of one per day. That’s a conservative estimate. And who can blame them; they have seen the worst of mankind, experienced the horrors or war. Thinking about this yesterday I discovered a new piece of Grandpa Rupert’s puzzle (he died when I was young). I had hitherto only thought about him as an organic farmer and songwriter. Now I think of him as a war veteran who healed himself through the Earth. His songs of the Earth were inspired by a love of Mother Nature. Grandpa Rupert farmed organically in the 1950s, when his peers were starting to use chemical inputs. Grandpa used sawdust as a mulch, seaweed as a fertilizer, and extolled the lowly earthworm. He always would leave the soil better than he found it. Here is a link to one his songs I recorded http://www.youtube.com/watch?v=vnRo3kFQEFU. I remember him this Remembrance Day. I think of his journey, his redemption through the soil. Through my own experience with gardening, I know that working the earth in harmony with her creatures heals the spirit and energizes the soul. Let us all be semper fidelis to each other, to all creation from the earthworm to great ape. Let us wage not war on the earth but peace. Let us grow food as an act of healing, of love. And let’s give peas a chance! This entry was posted in Food heros, Gardening, Misc., Organic and tagged Farmer Veteran Coalition, Grandpa Rupert, Posttraumatic stress disorder, Semper Fidelis, This Earth is Ours, Vancouver Island, Veteran, WWI on November 11, 2013 by Gurdeep Stephens. 1.5 million pounds of pesticides were sprayed on crops in 1999 – mostly GMOs. In my opinion that’s 1.5 million pounds too many. Sit down and hang onto your hat, cuz in 2011 we were at 90+ million pounds of pesticides per year. 90+ million pounds of pesticides in our soils, in our waters and in the air. And that data is conservative. And that number is growing because of the superweeds and superpests. These GMOs were supposed to reduce chemical applications. Instead they have increased. Exponentially. For those people who believe that pesticide use decreased with GMOs, it didn’t. It hasn’t. Dr. Oz showed that very well. This is based on USDA data. Now there currently is an application with the FDA to spray 2,4 D, the active ingredient of agent orange. Over time, yields of GMOs are equalled or outperformed by Organic. For those who believe that GMOs hold promises…. In theory. To you I say: How about this approach – How about we just ban toxins? How about banning/labelling food with known carcinogens and neurotoxins, and endocrine disruptors? Let’s stop poisoning people and planet whilst we debate the morals and ethics of GMO technology. I’ve copied this graph on Glyphosate use and explanation from the Farm Wars website. This is just one pesticide being sprayed on our crops….. Contrary to claims made by the chemical industries, glyphosate use increased 6,504% from 1991 to 2010 according to data from the USDA: National Agricultural Statistics Service (NASS). States participating in the USDA surveys reported applying a whopping 91,200 tons (1 rail car holds approximately 100 tons) of glyphosate on corn, cotton and soy crops alone in 2010 (see graph). Glyphosate is the active ingredient in Roundup™, the herbicide used on Roundup Ready™ crops genetically engineered (GE) to withstand glyphosate. Glyphosate residues of up to 4.4 mg/kg have been detected in stems, leaves and beans of glyphosate-resistant soy, indicating metabolism of the herbicide. This means that the Roundup Ready™ plants are absorbing the herbicide and you cannot simply wash it off. This entry was posted in Food heros, Mobilize and March, Organic, Right to Know, The Environment and tagged Agriculture, Dr Oz, Genetically modified organism, Glyphosate, GMOs, Increased Pesticides, Living Maxwell, Mehmet Oz, Organic, Pesticide, Superpests, superweeds, USDA on November 8, 2013 by Gurdeep Stephens.